Vegan black-eyed pea curry with "light" coconut milk. Vegan black-eyed pea and roasted red pepper hummus . I started the Foods For Long LIfe blog a year ago on New Years day. And, of course, I started it with a black-eyed pea recipe. In the south it's traditional to eat black-eyed peas on New Years day for a year of good luck. OK, why is an Italian from Brooklyn telling you this? Because I picked up this tradition as a student at the University of Texas and I've been doing this ever since. I've passed it on to my children and they will undoubtedly pass it on to theirs. Traditions are fun, especially those involving food. It's also fun to take this one ingredient and come up with a new recipe every year. It's kind of like "the Iron Chef". So this year I made a hearty curry and a dip - both perfect for a nice New Years day lunch or for watching football. And don't forget to leave 3 peas on your plate - that guarantees the good luck. For the dip, leave out 3 peas before you throw the rest of them in the blender. This will be my last post for the year. My husband is taking me on a romantic cruise through the Panama Canal to celebrate our 20th anniversary. That's why I'm posting these New Years recipes so early. I have really enjoyed writing this blog and I hope you've enjoyed the articles and the recipes. I've appreciated your positive comments and I'm thrilled when I hear of people improving their eating habits. My parting wish to you is to enjoy the holidays but don't over do. Eat and drink in moderation and try to get in as much exercise as you can in between social events. (Let's see how well I take my own advice on a 16 day cruise!). Think about the good things you did for your body in 2009 (lost weight, lowered your cholesterol, got off of a medication) and develop and write down your health goals for 2010. Have a wonderful holiday and I'll see you next year! Steam sweet potatoes until cooked (not too soft) and set aside. Heat oil and saute red pepper, onions and mushrooms until soft and the mushrooms release their liquid (about 5 to 7 minutes). Add garlic, half the cilantro and curry (to taste) and saute another minute or two until curry is blended in. Add black-eyed peas, sweet potatoes, broth and coconut milk and bring to a boil. Throw in the spinach and lower the heat. Cook 2 minutes or until the spinach wilts, gently stirring. Stir in the lime juice and top with the rest of the cilantro and serve over cooked rice, polenta or noodles. Per serving (curry only): 264.3 calories, 8 g fat, 3.5 g saturated fat, 0 mg cholesterol, 8.1 g protein, 39.6 g carbohydrates and 8.5 g of fiber. Rinse the roasted red peppers well, removing any seeds or blackened skin. Combine all ingredients (except parsley or cilantro) in a food processor or blender and process until smooth, occasionally scraping down the sides. Top with fresh cilantro or parsley and serve with raw veggies or baked chips. Per serving: 70.5 calories, 2.6 g fat, 0.4 g saturated fat, 0 mg cholesterol, 2.6 g protein, 9.9 g carbohydrates and 1.9 g of fiber. Walnut and mushroom pâté - vegan chopped liver substitute. 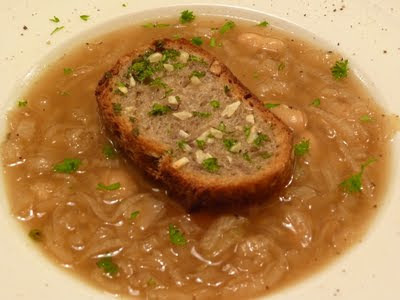 Vegan French onion soup with Cannellini beans and garlic toast. 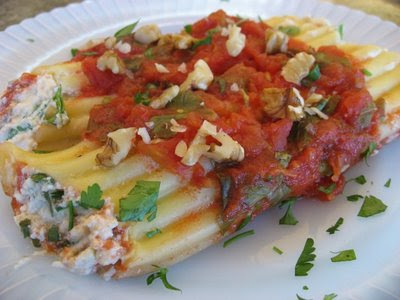 Vegan Manicotti with sprouted tofu and tomato basil sauce. 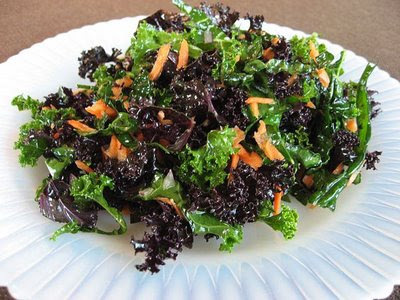 Raw kale salad with 3 types of kale and shredded carrots. 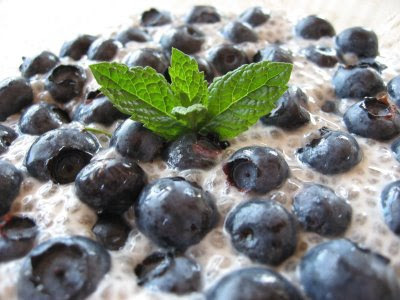 Vanilla chia seed pudding with hemp milk and blueberries. 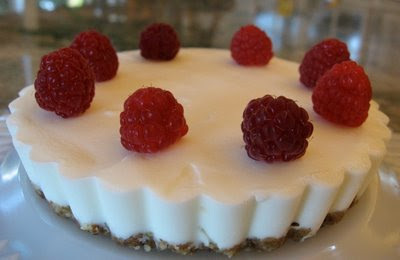 Soy ice cream tart on a raw walnut crust with fresh berries. Whether you are vegan and preparing an entire holiday meal for your family or if you're not vegan and would like to have some healthy meatless recipe ideas for the holidays, you've come to the right place. 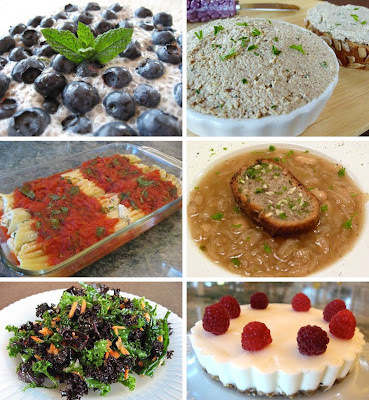 In 2009, I've posted over 70 original, healthy vegan recipes. Here are a few of them that I've put together for a holiday menu. Enjoy! Please click on recipe titles to link to the actual recipes and then hit the back arrow to return to this posting. This Walnut and mushroom pate recipe is a great substitute for chopped chicken liver and pâté du foie gras. Serve it with a sliced baguette or with crackers. For our soup I selected an old classic with a vegan twist. This French onion soup recipe is made with a quick, home-made mushroom broth and is topped with garlic toast. It also has protein-rich Cannellini beans. Being Italian, most of our big holiday meals centered around a large tray of lasagna or beautiful individual manicotti or stuffed shells. So it was natural for me to pick my Vegan manicotti with sprouted tofu and tomato basil sauce recipe for the main course. I've paired this with a Raw kale salad with different types of kale, shredded carrots and a lemon vinaigrette. We've left room for 2 light and healthy desserts. The first is a Vanilla chia pudding with hemp milk and blueberries. Instead of blueberries, you can make it with pomegranate seeds or diced Fuyu persimmons. The second dessert is an Ice Cream Tart with Raspberries on a raw walnut crust, filled with vanilla soy ice cream. Fold in cranberries, walnuts and chocolate chips. Drop tablespoons of batter on a lightly greased cookie sheet. • Use organic white whole wheat flour or organic oat flour instead of regular white flour - It has 3 times the fiber. • Use Sucanat or organic cane sugar and cut down on the amounts. • Only use aluminum free baking powder. Studies suggest a link between aluminum and Alzheimer's. • If you use eggs, buy omega 3 enriched, organic, cage free eggs. Vegan egg replacers can be used instead of eggs like Ener G egg replacer. • If you use dairy, buy organic butter made from milk free of bovine growth hormone and antibiotics. Vegan buttery spreads like Earth Balance can be used instead of butter. • Substitute some of the fat with unsweetened apple sauce or pureed prunes. • Go light on the chocolate. Opt for dark chocolate with a higher percentage of cacao. • Use raw English walnuts in your cookie recipes. They are rich in omega 3 fatty acid. This is basically a healthy oatmeal cookie made with a white whole grain or oat flour and less sugar (only 1/3 cup) and less fat (only 1/4 cup) than most cookie recipes. Feel free to substitute the cranberries with raisins or dried cherries. You can substitute the English walnuts for pecans or other nuts. Dark chocolate chunks or carob chips can replace the milk chocolate chips. Have fun and experiment. Check out the Vegan Version of this recipe. Preheat the oven to 350 degrees. In a large bowl, combine applesauce, sugar, butter, and vanilla and mix well with a fork. Add a lightly beaten egg to this mixture and combine thoroughly. In another bowl, combine oats, flour, baking powder and salt and mix well. Add the dry ingredients to the wet ingredients and gently combine. Fold in the cranberries, walnuts and chocolate chips and drop 24 tablespoons of this mixture on to a lightly greased cookie sheet. Bake for 12 minutes or until lightly brown. Remove from oven, let sit on the cookie sheet for 2 minutes and then remove to a wire rack to cool. Per cookie: 75.4 calories, 3.6 g fat, 1.6 g saturated fat, 15.3 mg cholesterol, 1.5 g protein, 9.9 g carbohydrates, 0.9 g fiber, 132 mg omega 3 and 657 mg omega 6 fatty acids. Guacamole and raw jalapeno corn chips - a great appetizer. Raw vegan substitute for chopped chicken liver. Easy-to-make raw split pea soup. 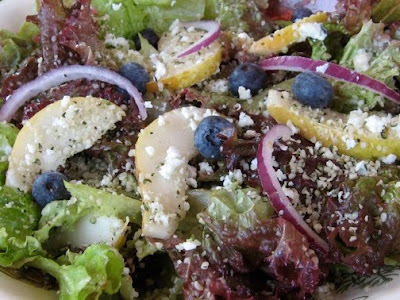 Pear salad with blueberries and raw goat feta on greens. 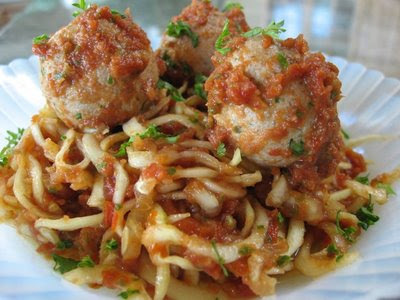 Zucchini spaghetti and walnut meatballs - a blog favorite. Chia pudding with pomegranate seeds - healthy and festive. Delicate raw chocolate truffles dipped in coconut. Although you may still be full from Thanksgiving, tonight is the beginning of Hanukkah and Christmas and New Years eve are close behind. 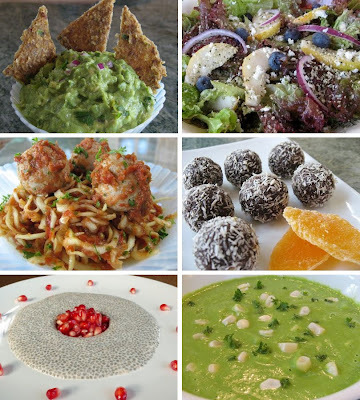 Here is a complete raw menu pulling together some of the many raw recipes I've posted this year. OK, they're not the traditional sliced prime rib and green bean casserole recipes, but being a healthy raw vegan isn't traditional either. I hope you enjoy. 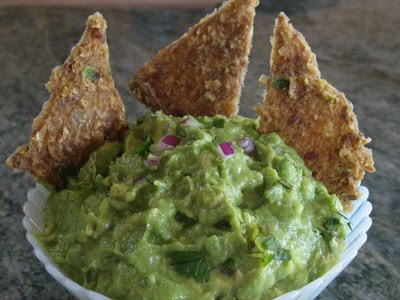 Guacamole is a popular appetizer and this Guacamole and raw jalapeno corn chip recipe is no exception. You'll have to start the corn chips a day in advance but you can whip up the guacamole right before you need it. If you are making it in advance, leave the pit in the middle of the dip and cover it tightly with plastic wrap. 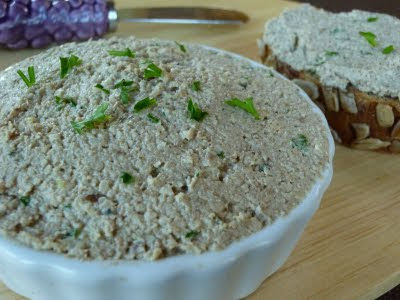 Another good appetizer is a raw Walnut mushroom pate that makes a great substitute for chopped chicken liver. 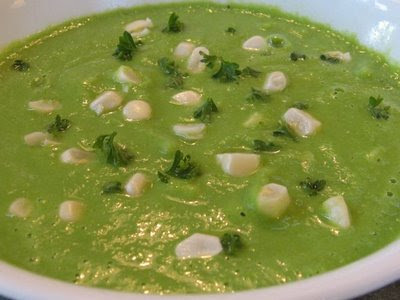 Raw soups are fast and easy to make. This Raw vegan split pea soup will make a great soup course to a large meal since there is little fuss. You can use frozen peas and corn so no worries about finding ingredients in the middle of winter. For the main course, we have Raw zucchini spaghetti and walnut meatballs. This recipe is perhaps the most popular raw food recipe on this website so I thought it only fitting that it be served on these important holidays. With it is a Pear and blueberry salad with raw goat feta, hemp seeds and apple cider vinaigrette. If you don't do raw cheese, just omit it. 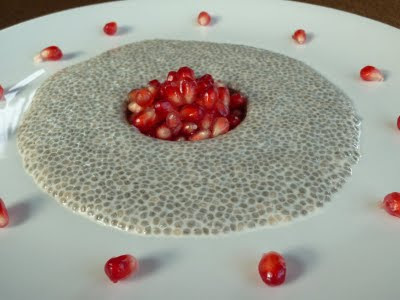 Since I write so much about chia seeds and have quite a few chia seed recipes it should come as no surprise to find Chia pudding with pomegranate seeds as part of this important menu. 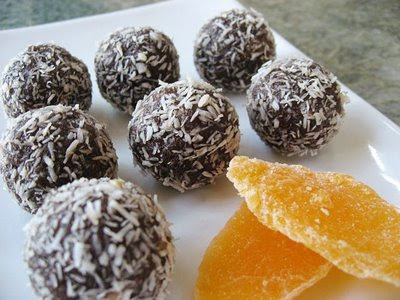 To add a little chocolate surprise to the meal, here's the recipe for Tropical chocolate truffles. It's one of our favorite recipes and is enjoyed by all - raw foodist or not. As many raw foodists will be going home for the holidays and are probably worrying what they will eat, bring along these recipes and prepare a few of them for your family and friends. I've introduced raw food to many people and the folks you least suspect would be interested in it turn out to be the most interested. Enjoy! This whole pomegranate yielded about 1 1/2 cups of seeds. Slice off the top of the pomegranate with a sharp knife. Score pomegranate rind in four sections . Break into pieces under water and separate seeds from pith. Seeds will sink to the bottom and white pith will float to the top. Skim rind and white pith from top of water and drain seeds. Nothing is prettier than bright red pomegranate seeds garnishing desserts, salads and other dishes. Especially during the holidays. But these seeds aren't only beautiful, they are packed with antioxidants that protect against the harmful damage of "free radicals". They are high in vitamins C and K and are also a good source of folate and fiber. You get the most fiber and nutrients if you eat the seeds whole but you can also run them through a juicer. The first time I saw one of these things I had no idea what to do with it. I busted it open and seeds flew all over the place. I didn't buy another one for quite some time. But I couldn't ignore the health benefits and the delicious taste of these little bright red seeds so I decided to try it again. After searching the internet, I found out the secret is to clean the little guy under water. First slice off the top, score the rind in 4 quadrants and break the pomegranate apart over a bowl filled with water. Submerge the broken fruit and start separating the seeds from the white pith with your fingers. They will immediately sink to the bottom and the pith and rind will float to the top. Skim off the pith and rind and drain the seeds. This fat pomegranate yielded about 1 1/2 cups of seeds. The little red seeds make any dessert look festive. Mixed with chia pudding made with hemp milk also makes this one of the healthiest desserts you can eat. Hemp milk and chia seeds are two of the best vegan sources of ALA omega 3 fatty acids. Omega 3 is known to support heart health, reduce inflammation, boost your immune system, prevent depression and reduce joint pain. Each serving of this recipe provides 3.6 grams of omega 3. That's practically all a healthy vegan would need for their own bodies to produce enough of the beneficial DHA and EPA omega 3 fatty acids (typically found in fish) needed for one day. This recipe is also very low in calories and provides over 25% of your daily requirement of fiber. * for a totally "raw" dessert, just add pomegranate seeds to my Amazing Chia Pudding recipe made from soaked cashews and dates. Combine chia seeds with hemp milk and liquid stevia and stir vigorously with a fork for several minutes. Let sit for 15 minutes and stir again until the chia seeds are well blended and separated. Let the mixture sit out for an hour and stir one more time. Refrigerate 8 hours or overnight until thickened and firm. I always make this a day ahead in order to give it time to set. Serve in four bowls each topped with 2 tablespoons of pomegranate seeds or in one large bowl with the pomegranate seeds in a separate small serving bowl. Per serving: 123 calories, 8.3 g fat, 1.5 g saturated fat, 0 mg cholesterol, 3.8 g protein, 20.3 g carbohydrates, 7.0 g fiber and 3.6 g omega 3 and 2.9 g omega 6 fatty acids. Crabs are now in season and can make a very special holiday meal. You can toss chunks of crab on a large Caesar salad and serve with champagne (for a simple but elegant meal), or you can try this crab stuffed Portobello mushroom. Dungeness Crabs are low in mercury and are listed as a "best choice" by the Monterey Bay Aquarium Sustainable Seafood Guide. They are a very good source of protein, vitamin B12, zinc, copper and selenium. They are also a source of DHA and EPA, the most beneficial omega 3 fatty acids. They are somewhat high in cholesterol so eat them in moderation. * It takes about 3 pounds of crab to get 1 pound of crab meat. In a mixing bowl, combine milk and breadcrumbs and set aside. In a small fry pan, heat the butter and saute the onions and bell peppers until tender. Remove from stove and let cool a bit. With a small spoon, remove the gills of the Portobello mushrooms until they are smooth inside. Place them in an oiled baking dish. Pick through the crab making sure there are no shells. Put the onions, bell peppers, crab meat, parsley, Old Bay seasoning, baking powder, Worcestershire sauce and egg into the bowl with the bread crumbs and milk. Toss gently to combine leaving nice chunks of crab intact. Fill the Portobello mushrooms with the crab mixture. Loosely cover the baking dish with aluminum foil and bake for 35 minutes. Remove from the oven. Top each stuffed Portobello with chopped parsley and serve with a wedge of lemon. Per stuffed Portobello: 164.3 calories, 3 g fat, 1.3 g saturated fat, 63.7 mg cholesterol, 21.7 g protein, 12.7 g carbohydrates, 2.4 g fiber and 321 mg of omega 3 fatty acid. You only have to look at your dinner plate to see the how nutrition your meal is. Phytochemicals, or beneficial plant chemicals, come in all different colors. This colorful salad is bursting with color and nutrition. You should opt for eating as many colors as you can each day and no, multi-colored MM's don't count. I'm a big fan of hemp seeds and hemp seed products. They are high in omega 3 fatty acid and they are also a great source of high quality protein. Add them to your salads, over your morning bowl of fruit or hot cereal or anywhere you would use healthy seeds. I like the Nutiva brand. They are non-GMO certified and offer raw, organic product. To learn more about hemp read, "Hemp Horizons: The Comeback of the World's Most Promising Plant". The salad gets its high content of omega 3 from both the hemp seeds and the flaxseed oil. Each serving provides over 2 grams each of omega 3 and omega 6 essential fatty acid. Although omega 6 deficiency is rare, omega 3 deficiency is common. Omega 3 is needed for proper functioning of ALL body tissues and is especially needed when pregnant for proper fetal development. This important fatty acid also reduces inflammation and is important for a healthy heart and brain. Omega 3 deficiency symptoms include heart disease, poor immunity, fatigue, brittle hair and nails, joint pain, lack of concentration and depression. 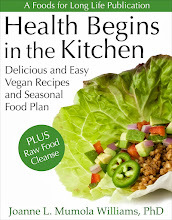 Tear the head of lettuce into a large salad bowl. Add pear, onion and blueberries. Prepare the salad dressing by combining apple cider vinegar, olive and flaxseed oils, agave syrup, salt and pepper. Toss the salad with some or all of the dressing and divide into 4 salad bowls. Top each bowl with hemp seeds and shaved raw goat feta. For a vegan salad, omit the goat cheese. Per serving: 194.7 calories, 14.5 g fat, 2.4 g saturated fat, 6.3 mg cholesterol, 4.1 g protein, 15.4 g carbohydrates, 2.7 g fiber, 2.4 g omega 3 and 2.4 g omega 6 essential fatty acids. When traveling, the healthiest breakfast you can order is usually oatmeal but I'm always surprised to see it served with massive amounts of brown sugar, cream, and raisins. You really don't need all this. In today's recipe, the oatmeal needs no added sugar and is flavored with vanilla and cinnamon and sweetened with fresh banana slices and a modest amount of raisins. A bit of added oat bran adds more fiber and raw English walnuts allow each serving to provide over 1 gram of omega 3 and 5 1/2 grams of omega 6 essential fatty acids. Each serving also provides over 10 grams of protein and 9 grams of fiber (over 1/3 your daily requirement). Oats and Oat bran contain the fiber "beta-glucan" which has been shown to lower bad cholesterol which in turns reduces the risk of stroke and cardiovascular disease. Years ago, my husband Doug lowered his cholesterol from 240 to 179 in three months by eating this recipe every morning (sometimes he substituted diced apple for the banana for variety), exercising at least 30 minutes a day and taking 500 mg of time released niacin at dinner and again at bed time. His doctor, who was insisting that he take statin drugs (which carry their own risk and have numerous side effects), was shocked to see him lower his own cholesterol so quickly. Before taking this much niacin for this long a time frame, however, you need to talk to your doctor. They may monitor your liver enzymes. Beta-glucan also has a stabilizing effect on blood sugar and helps lower the risk of type 2 diabetes - one, because of the effect of the fiber and two, because oats are very high in manganese. Manganese is a co-factor for hundreds of enzymes including those involved in the secretion of insulin. Manganese is also important in the metabolism of carbohydrates and amino acids and supports bone health and energy production. Boil water and vanilla. Add oatmeal, oat bran, salt and cinnamon, (stirring constantly while adding). Cook uncovered for 5 minutes until it thickens. Add banana slices and raisins and stir while cooking another 30 seconds. Turn off the heat and cover. Let sit for 2 minutes. Stir in the raw walnuts and serve. Adding the raw walnuts at the end helps preserve their omega 3 content. Serve with a little soy milk if desired. Per serving (2 servings): 339.5 calories, 10.8 g fat, 1.3 g saturated fat, 0 mg cholesterol, 10.7 g protein, 59.5 g carbohydrates, 9 g fiber, 1.1g omega 3 and 5.5 g omega 6 fatty acids. Cut onions in half length-wise and thinly slice. Make a quick stock from cremini mushrooms and vegetables. Home-made mushroom stock replaces traditional beef broth. Caramelizing onions takes time and patience. For fewer calories, serve the soup without the garlic toast. This classic is typically made with a beef stock and topped with a baquette slice covered with shredded cheese (like a Gruyere). The soup is placed in flame-proof bowls and put under the broiler until the cheese melts. This lighter version is made with a home-made mushroom stock. Mushrooms have a "meaty" taste and create a dark broth that gives the finished soup the expected color. By topping it with garlic toast, you avoid the complexity of broiling and handling hot soup bowls. This can be tricky and dangerous during a dinner party. Adding Cannellini or white kidney beans provides added protein and dietary fiber and turns a soup course into the main entree. Onions are in the Allium family. They contain the beneficial sulfur compound, "allyl propyl disulphide". In addition, onions are very high in dietary fiber, vitamin C and chromium. Chromium is an important trace mineral that helps regulate blood sugar as well as cholesterol and triglyceride levels. Onions are also a good source of vitamin B6, folate, potassium and manganese. In addition, red and yellow onions contain a number of important flavonoids such as quercitin, a powerful antioxidant. Quercitin and other flavonoids have been associated with protecting cells against cancer-causing substances and reducing the risk of many cancers. In fact, onions are said to reduce the carcinogenic effects of eating meats barbecued with high temperatures. Onions also have anti-inflammatory and anti-bacterial properties. They are known to reduce respiratory congestion. This rich and filling soup only has a little over 200 calories per bowl with only 0.4 grams of saturated fat and no cholesterol. It provides nearly 8 grams of good quality protein and more than a third of your daily requirement of dietary fiber. To make the broth, combine "stock" ingredients above in a pot and simmer partially covered for an hour. Make the onion soup while the stock is simmering. Using a non-stick 5 quart dutch oven or soup pot, saute the onions in olive oil, stirring occasionally for about 15 minutes. If you do not have a non-stick pot, use 2 tablespoons of olive oil instead of one. Add the sugar and cook another 45 minutes, stirring frequently until the onions caramelize and turn a light brown. After an hour, while the onions are still cooking, remove the simmering stock from the stove and strain out the mushrooms and vegetables, reserving the stock. You should have about 7 cups of stock. Discard the veggies but feel free to eat the mushrooms while you are preparing the rest of the soup! Once the onions are caramelized, add garlic and thyme and saute for a minute. Add the reserved mushroom stock and the cannellini beans and simmer uncovered for 15 minutes. Add salt and freshly ground black pepper to taste. While the soup is simmering, turn on the broiler and cut 6 thick slices of baguette. Put a little of the garlic-herb spread on each slice and toast under the broiler. Divide the soup into bowls and place a piece of garlic toast on each and serve. Per serving: 228.5 calories, 1.5 g fat, 0.4 g saturated fat, 0 mg cholesterol, 7.9 g protein, 42.5 g carbohydrates and 9.3 g of fiber.